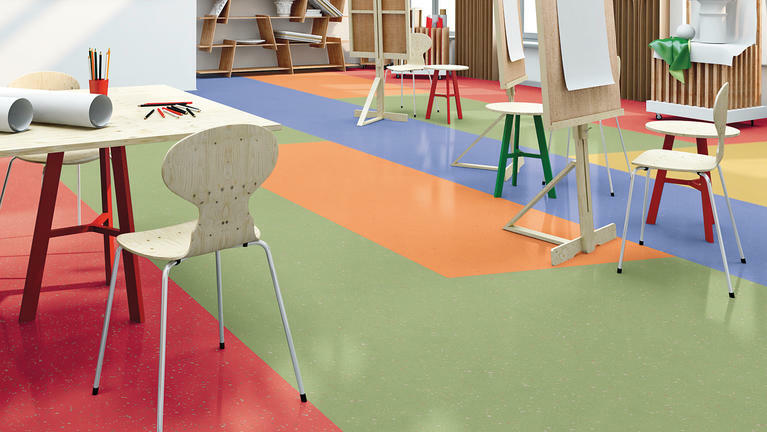 Cortina Grande® SVT (solid vinyl tile) can increase productivity in high performance spaces by making people more comfortable and lowering maintenance costs and downtime due to its solid vinyl heterogeneous construction. Offered in 42 broad-ranging colors and 16” x 16” tile with smooth or six with slip resistant texture, Cortina Grande can motivate and inspire through color, pattern and design. There are also eight vibrant Karim Kolors, for a total of 50 colors in the line, and four unique Karim Shapes that allows Cortina Grande to create different designs alone or coordinate perfectly with GemStone™ SVT.